What are some things to consider when choosing a contractor? Confirm their license status and complaint history. In Connecticut this can be done through the link to The Connecticut Department of Consumer Protection at www.dcpaccess.state.ct.us/hic.htm. Another source for information on Connecticut businesses is the Better Business Bureau’s website www.connecticut.bbb.org . Ask for insurance certificates and confirm with the insurance company that the policies are current. Do they belong to any trade associations? A pool builder who belongs to a trade association has an interest and has made a commitment to their industry. Most trade associations offer members educational information and the opportunity to explore the latest trends and practices. Members are asked to abide by a code of ethics and to uphold professional standards. 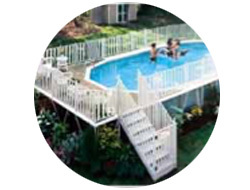 The primary organization for pool builders in this country is The Association of Pool and Spa Professionals. Go to www.theAPSP.org for information on pool builders in your area. Connecticut pool companies should also have a SP1 licensed tradesman on staff as apposed to simply a Home Improvement Contractor. To obtain this SP1 license, one must provide proof of apprenticeship or completion of an approved training program in the swimming pool industry. What are some things to consider about scheduling? 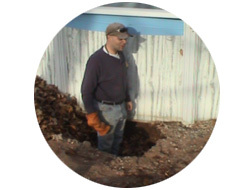 Beware of the contractor that promises you that your pool will be completed by a specific date. There is hardly a week that goes by in the swimming pool installation season where something doesn’t happen that can affect the completion of a pool. Weather can be a very serious setback that we obviously have no control over. Equipment can break down. Employees can call in sick or have a family emergency. There can be permit or site issues that arise. And the pools themselves can be defective or have missing parts. For these many reasons we have found it most productive to actually only schedule our crews for a four day week. Most of the crews work 5 or 6 days a week and what this does is ensure that we are always taking into account the potential setbacks that may occur and it gives us a better chance of completing your pool earlier that expected rather than later. This makes for a better experience for our customers and crews. But it also means that when you call Tolis and Associates to schedule the installation of your pool, we will be giving you a “week of” completion date. And we schedule our installs in the order in which we receive the deposits and signed contracts from our customers. On the Thursday or Friday of the week prior to your week of installation you will receive a call from our office to schedule the first phase of construction which is the dig and sand delivery. Typically within a few days of the dig completion, the installation crew will arrive to finish the pool. The day before each phase you will receive a confirmation call from the office or crew chief. Because of this successful way of scheduling it is not unusual for us to get ahead of schedule. For this reason it is always a good idea for our customers to be as prepared as possible, as early as possible after sending us their contract. This way if we call to move up your install dates, you will be ready to take advantage of this opening in our schedule. What kind of access to the back yard is necessary? Access to the back yard for the equipment is very important: 7 feet of width is needed for the bobcat and 11 feet of width for the dump truck. When deciding how you would like the equipment to reach the site, consider that tire marks are likely. If the ground is very soft, deep tracks may result. The homeowner is responsible for repairing any lawn damage. If this is a concern, we can plank the lawn for $100 per 100 feet. If you are getting a sand bottom (with planking) or the Dump truck cannot access the back yard or you would rather it did not, we can machine the sand to the pool site. This charge will be $30-$90 depending on your pool size. To save this machining charge, homeowners have the option to move the sand themselves. Keep in mind that this is 3-8 tons of sand, plan on 2-3 hours of work time. All sprinkler heads should be flagged and any heads and lines should be removed from the dig area prior to the digger’s arrival. Add 4-6 ft to the diameter of the pool to figure the dig area. Adjust remaining heads so they do not spray the pool. 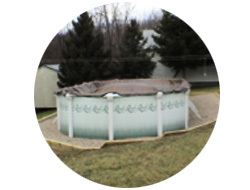 How is a pool installed on a sloped yard? Below are some examples of how we installed pools in some off level yards and some ways customer landscaped around their pools. This is a service we can also provide. What are some landscaping options? Using a railroad tie to trim high side then sloping the dirt down to save the expense of building a wall. 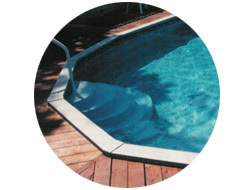 Some oval pools have bracing on the straight sides that extend out 3ft from the side of the pool. We typically over dig the pool two feet from the pool wall. If you have a three foot buttress we will dig four to five feet from the pool wall in the buttress area. Some pools without buttresses still have a piece at ground level that extends out 3ft. 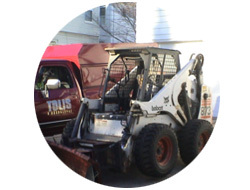 Our digger usually arrives a few days before the installation crew and needs this information ahead of time. Pools with short or no apparent buttresses have an additional structure that needs to be installed under the pool. This substructure requires additional labor which will be calculated into the proposal. Sometimes the outline of these parts can be visible through the sand. This won’t harm the liner. 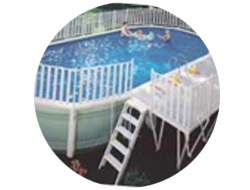 However, if this is a concern, we would suggest that you consider one of our pool base options. 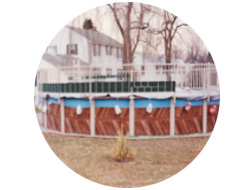 Most decked round pools come with 2 piece fan decks. Our round decked pool prices are for this type of deck. 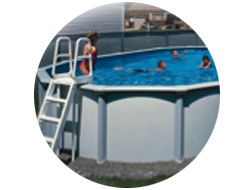 If your pool has additional panels, there is an additional charge for the installation of the extra panels. 2 piece fan deck. Enter 2 panels. This is a square deck on a round pool. Enter 4 panels. 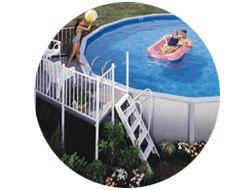 Oval pools can have decks along the straight side (side decks) or on the end (end decks). Stake and label the location of the deck so that the digger can excavate the area for the deck. 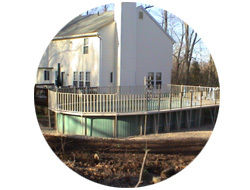 An end deck has twice the panels of a side deck which requires extra labor. 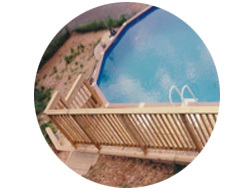 If your pool has an end deck, check this box and this labor will be figured into the quote. **Remember to stake and label the deck location when you mark out the pool location. What is a slatt wall? Some Esther Williams and Johnny Weismuller pools come with a slat wall as opposed to a rolled wall. 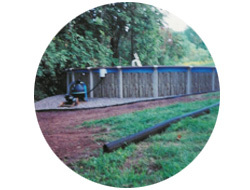 A rolled wall pool comes in one piece that is unrolled and seamed together with a row of bolts. A slat wall pool comes in hundreds of interlocking pieces that make it by far the strongest wall available, but also adds labor that will be figured into this quote. What options are available for the pool’s base? 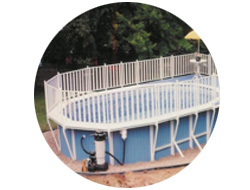 The standard pool base that is quoted is a sand base that we have used successfully on thousands of pools. There are some improved base options that warrant strong consideration. We need to know before the pool is dug which base you would like. If you have purchased an oval pool with no braces there is an additional item to consider. In order to compensate for removing the braces, extra frame work is added under the pool. The outline of these parts can become visible under the liner. It usually does not affect the life of the liner. However, if this happens you should have an installer inspect it to confirm this. The optional bases give much better protection against this. 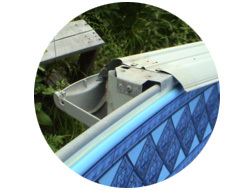 We have found that 9 out 10 times damage to a liner happens from someone or something inside the pool. Because our foam base offers the best protection from this type of damage, more than half our customers choose this option. If, however, you have unusually rocky, wet or heavily rooted soil you should consider the vermiculite base. The truly ultimate base would be to put the foam over the concrete. 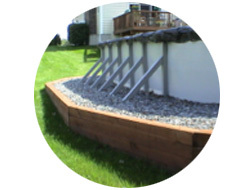 Keep in mind that the cost of adding these base options to your initial installation is less than the cost of a liner change ($500 – $1000). Having either of these bases should save you at least one liner change over the life of the pool. What is the foam base? Gives years of a soft sturdy bottom to your pool. What is the vermiculite base? We guarantee a firm, permanent base that won’t wash out. Sand and clay wash out easily. Most contractors will not cover this type of damage under their warrantees. 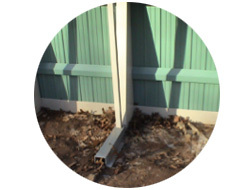 Washout is particularly common in slopped yards when water from the rest of the yard or the house gutters is directed toward the pool. 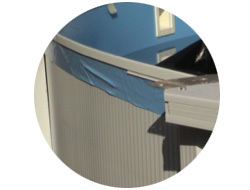 Washout can also happen when a filter hose fails or when a liner develops a leak and can be quite extreme in the case of a liner seam split. This should cause extra concern if your pool is above yours or your neighbor’s home. 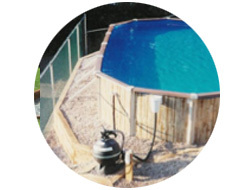 When a liner gets a small tear, water begins to leak near the wall of the pool. This can wash sand out from underneath the liner, causing the liner to stretch. Meanwhile, the tear gets bigger causing a larger hole in the ground. It is this kind of leak that can cause considerable damage to the area surrounding the pool. When over 50 tons of water starts to move, it can cause quite a bit of damage. A Vermiculite pool base will control root, stone & grass intrusion much better than sand and clay. Recently wooded areas that have heavily rooted or stony soil should give this type of base extra consideration. This base should also be considered if the pool area tends to stay wet for long periods. 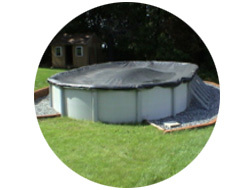 Some types of oval pools have substructures under the liner that allow sand and clay to settle around these parts. This settling shows up as sink areas under the liner. Ask the contractors you are considering if their warrantee covers this. We guarantee that vermiculite concrete will hold its shape against this type of settling. Liner replacement is less expensive with this type of base. Sand and clay bases have to be raked and repacked after the old liner is removed, which increases the time the job takes by up to 30%. 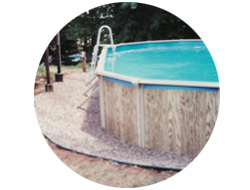 With a vermiculite pool base, we give a $100 credit on every liner change for the life of the pool. When averaging the cost over the life of the pool, it should be no more than $20 a year for a considerably more stable foundation. 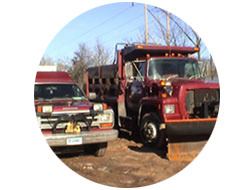 Can excavated material be hauled away? What is the difference between a beaded or overlap liner? Will my deck be an issue? Will I need a sand delivery for a liner change or replacement pool? This is an example of a major liner failure that would require a sand delivery if our foam base option is not being used. Washout larger than this may still need a sand delivery.